America's top rock hounds are gathering in Virginia to decide where on Mars they want NASA's next rover to land – not just so it can survey the Red Planet but also so that it can send back useful samples. NASA has already announced that it will send a newish rover to Mars in 2020. The probe will use the same body shell as the Curiosity rover currently trundling across the Martian surface, but it will be packed full of new instruments, including a drilling rig capable of taking core samples. The plan is for Curiosity version 2.0 to take 31 samples of Martian bedrock and pack it into a specially designed carrying case. NASA then wants to return these samples to Earth where they can be properly tested to see if evidence can be found for past life on the Mars. "If samples were returned, the science that could come out of that would be equivalent to when the Apollo samples came back from the Moon. It changes everything," John Mustard, a planetary geologist at Brown University, told Nature. To achieve this, NASA has a multi-stage plan. The agency will launch a second Mars mission with a lander containing a smaller rover and a rocket. After that rover collects the canister from Curiosity 2.0, it will return to the lander and load it onto the rocket, which will punch out from the surface and go into orbit around Mars. 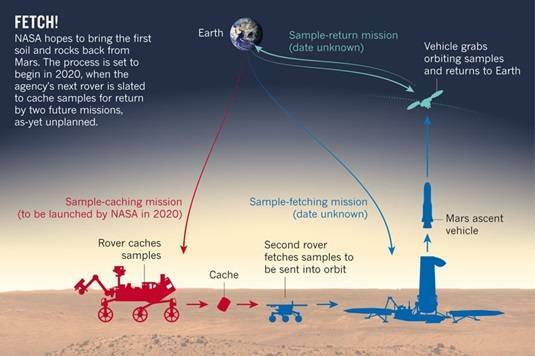 A third probe will then be sent out from Earth to collect the sample from the Mars orbiter and return into our planet's orbit. There it can either be picked up in situ by astronauts or landed on the planet for analysis, hopefully more successfully than previous attempts. It's a hugely ambitious plan, and given the amount of things that can go wrong in such a scheme, it's also a somewhat perilous one. It might be better to bring the humans to Mars than bring Mars to the humans, but that would be even more expensive – unless it was a one-way trip, and NASA doesn't do those. Given the intricate plan, those core samples had better be worth something. After three Mars missions, if NASA announces that they contain little more than inert sandstone, heads will roll – so the Virginia conference is trying to pick the right spot on the entire planet that will give the answers we want. "The next 20 years of Mars exploration hinges on where this rover goes," says Philip Christensen, a planetary scientist at Arizona State University in Tempe. "It has to tell us something fundamental about the broader history of Mars." Geologists are split between landing the sample return mission in a spot already surveyed, so that we have a better idea of what we get, or to drill in a totally new site and hope to find buried treasure. One of the top spots under consideration is the Eberswalde Crater, a series of dried up river beds that was originally considered as Curiosity's landing spot, instead of the rover's current home of Gale Crater. The current conference is being put together to go over the options and hear presentations from those who have a favorite spot to suggest. Don't expect a decision any time soon, however – with so much at stake, the landing spot might not be decided until 2019. "It will be a tremendously interesting and fascinating time," says Matthew Golombek, a planetary geologist at the Jet Propulsion Laboratory in Pasadena, California, who is leading the site-selection process.